I added the GCA101 module to the installation and disconnected Intellibox from the PC. Now it's simply one more device attached to Loconet Bus. There was a bottleneck in Intellibox when central station was "transforming" messages from Loconet to the USB serial connection to the PC. With not a lot of modules connected to Loconet many messages where lost due to Intellibox slowness when a high density of messages is generated in Loconet. 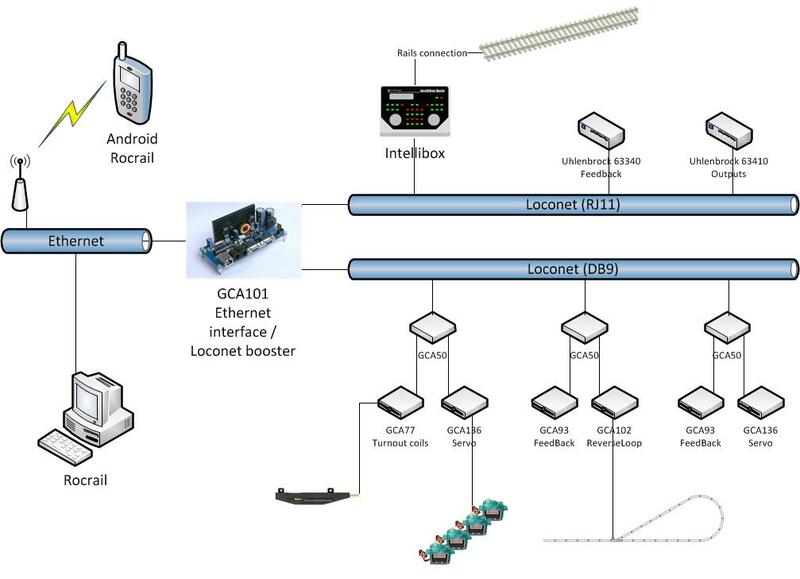 May be it isn't a problem only from Intellibox, because serial bus is slower that Loconet bus, but using a standard Ethernet connection everything runs fast and smooth. GCA101 has an optoisolated Ethernet connector with a dedicated processor to this part of communications. For Loconet management there is another processor (ATMEGA168) and the board itself is a Loconet booster and hub. There are two connectors of each two types for Loconet: standard Loconet RJ11 and special Loconet SUBD9 to use with GCA50. Those SUBD9 connectors used in GCA modules bring a 3Amp. power line to feed modules so you don't have to worry in how many modules will you use, there is power enough for sure! In my next post, I'll try to describe all elements and give technical details on how to connect all devices. Just as an advice, GCA101 has two jumpers that must be removed if you connect active Loconet modules (like Intellibox). If you don't do it, your Intellibox will burn!!! One jumper is to provide Railsync signal in loconet if no other device in the bus is providint it, and the other is to activate or not the 12V power line in RJ11 connectors. There is no problem in SUBD9 connectors because this power line uses separate pins, but in RJ11 is shared. 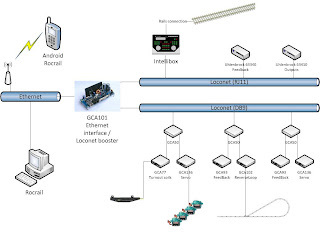 That's why Intellibox has a "Loconet B" and "Loconet T" connectors, one gives Railsync signal, and the other 12V. But this bad design of Loconet "standard" connect RJ11 will be discussed later. Keep reading to know the details of this digital schema for your layout.